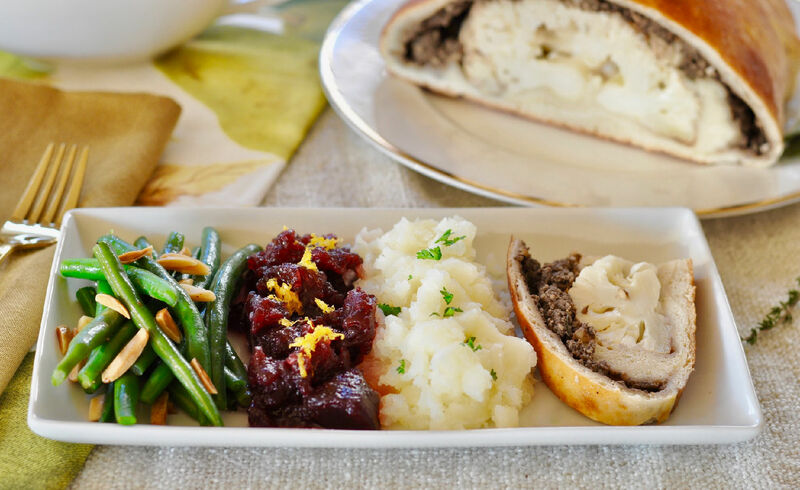 This healthy and delicious Cauliflower Wellington is a preparation of a whole cauliflower coated with a mushroom duxelles and Dijon, and then wrapped in puff pastry and baked. Preparation is really quite easy especially compared to the original vegan Wellington that I have posted for the past couple of years. The only changes I would make to this Cauliflower Wellington would be to prepare some extra mushroom duxelles for stuffing. Also, season, season, season! The roasting brings out a nutty taste, but the cauliflower still needs a lot of seasoning to sparkle. And don't forget to top off this Cauliflower Wellington with the most delicious vegan gravy ever! Incidentally, it is hard to believe that we are nearing the end of 2018. I would like to take this opportunity to thank all of you for your kind words and support. My mission in life since 2011 has been to keep you healthy. And what is healthy for your body is healthful for the planet. Did you know one person changing just one of their meals to plants, one time a day for a year can save almost 200,000 gallons of water? In addition, after one month on a full-time vegan diet, an individual will help avoid the death of 33 animals, the use of 33,000 gallons of water for animal food production, the destruction of 900 square feet of forest, and the creation of an extra 600 pounds of CO2 gas. Wouldn't that be a delightful way to begin the new year? Helping the planet and improving your quality of life by consuming more plant-based meals in 2019. Hope you enjoy this Cauliflower Wellington as much as we did. Don't miss any of Ordinary Vegan's recipes by signing up here. Need more Vegan Thanksgiving ideas. Here is a link. 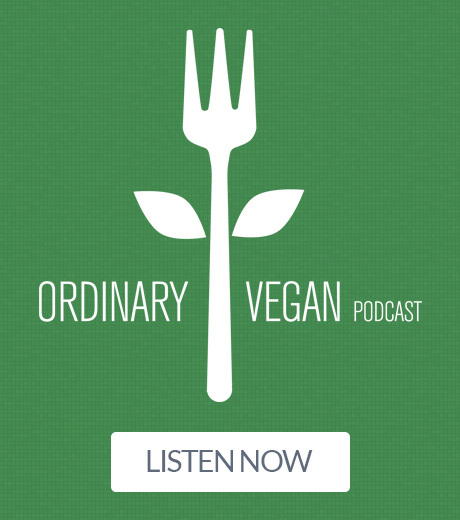 If you want to learn more about plant-based nutrition and how to get started on a vegan diet, Ordinary Vegan has a podcast. You can listen here on this website or on Spotify and iTunes . Last but not least, are you in search of safer pain relief? 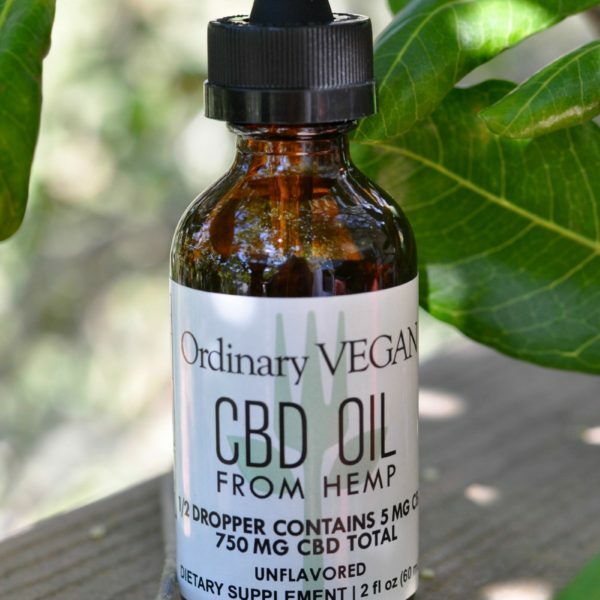 I am excited to announce that I now carry Vegan CBD Cream from Organic Hemp for deep pain relief. In 2016, a large study was done using CBD cream, and researchers found that the topical cream reduced both joint pain and inflammation without any side effects. 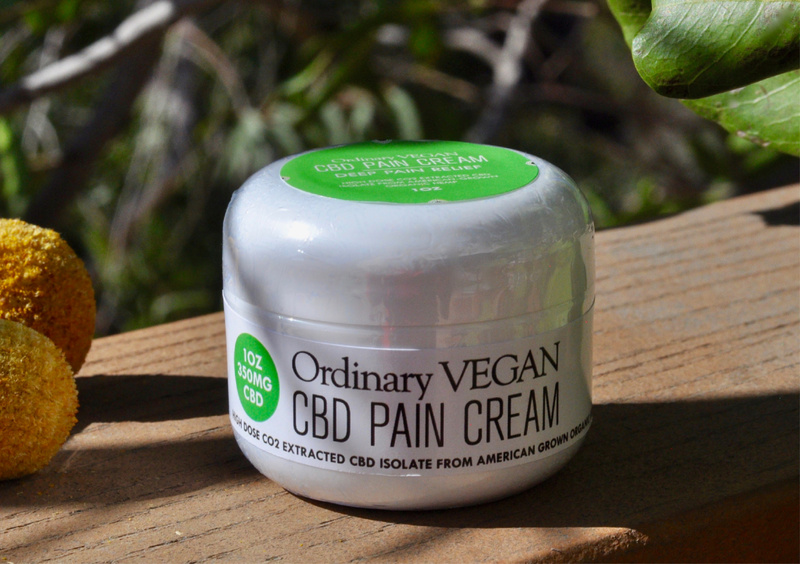 CBD Pain Cream works by enhancing the receptors in the skin to reduce pain and inflammation. And I decided on a pure CBD isolate so it would work faster. I also included other healthy healing properties such as arnica, hemp seed oil, vitamin E, almond and avocado butter, lemongrass and sustainably harvested lavender and frankincense. 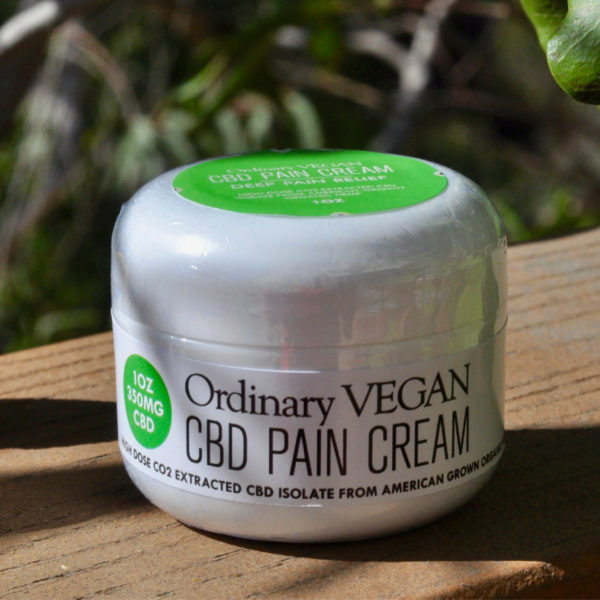 This cream has been two years in the making, and I believe that this is the highest quality vegan CBD pain cream on the market. I hope it can help you. If you have any questions, don't hesitate to ask me at questions@ ordinaryvegan.net. 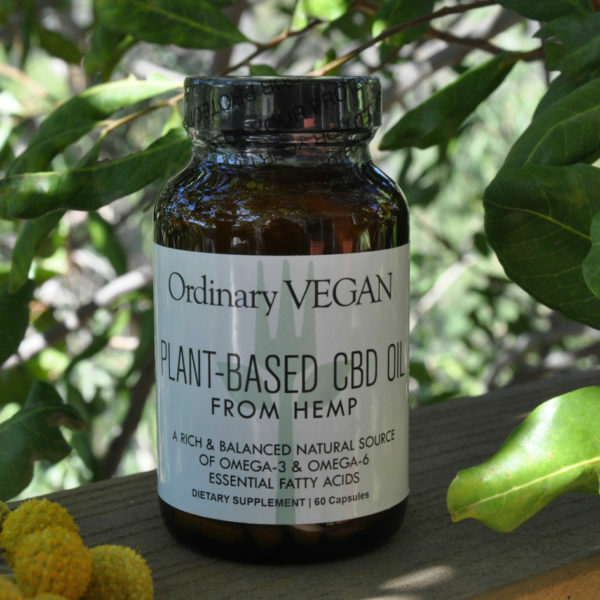 To learn more about CBD visit my FAQ list. I couldn't find any vegan frozen puff pastry so I used vegan dough instead. Both can work. You may also want to make such extra mushroom mixture. Bring a small saucepan of water to a boil. Add chestnuts and cook until soft, about 20 minutes. Drain and let cool slightly. Peel and chop chestnuts and set aside. Place the mushrooms, garlic cloves, walnuts, and chestnuts into a food processor. Process until finely chopped. Add the herbs, salt and pepper and pulse a couple of more times. Saute in a dry hot pan to intensify the flavors and remove the water from the mushrooms. This will take about 7-10 minutes. When all the water has been fried off, remove and refrigerate until assembly. Remove all the cauliflower leaves including the ones on the bottom of the cauliflower. Trim off the stem. Please the cauliflower on the baking sheet, stem side down. Brush the cauliflower with the herb butter covering it completely. Sprinkle on the ½ teaspoon of salt, distributing it equally. Season with ground black pepper. Bake until the cauliflower turns a light golden brown, 25 to 30 minutes. Brush with remaining butter and let cool. On a floured surface, place 1 puff pastry sheet on top of the other. Roll out the puff pastry or dough to a 14-inch by 14-inch round. Brush the dough with Dijon mustard. Spread the mushroom mixture over the dough leaving a 2-inch-wide border all the way around. Turn the cauliflower upside down on top of and in the middle of the vegan dough. Fold the dough around the cauliflower so that the whole thing is enclosed. Turn the cauliflower right side up and place it back onto the prepared baking sheet. 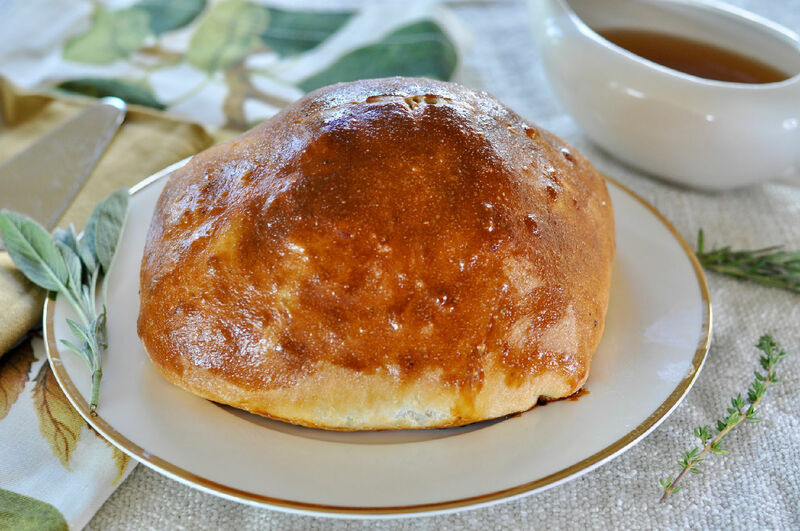 Sprinkle with ½ teaspoon salt and bake until the dough is cooked and a golden brown, 50-60 minutes. Let cool for 10-15 minutes before serving. Slice into wedges. Serve with vegan gravy. I cooked this for my daughter and son-in-law, although I missed out the chestnuts. It was easy and enjoyable to make and really tasty. I will definitely cook this again.